"Words are important but actions are the real test. Anyone who knew and did nothing or knew and covered it up should no longer be in a position of authority in the church. Holding individual bishops and administrators accountable would speak volumes..."
"Diane Whalen, 58, a spiritual director, wife and mother of two, was ordained last Saturday in a ceremony attended by about 300 people at Longhouse Education and Cultural Center at The Evergreen State College..."
"...The church is in trouble right now, and we need the wisdom of women," she said. "Unless there's a vehicle for that, that's not going to happen." Chiquita Center in Cincinnati, Ohio. School of the Americas Watch activist and friend, Ken Crowley, who works for Witness for Peace, was in Cincinnati today. 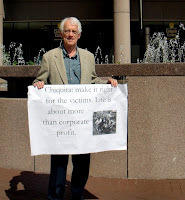 While he was inside the Chiquita Center doing his peace work, I walked outside carrying a poster that read: "Chiquita: make it right for the victims. Life is more than corporate profit." I was joined by Thurman Wenzl whose sign read: "Support Banana Workers’ Unions." During the Chiquita Brands annual shareholders meeting, Ken presented the names of 1,300 concerned citizens and shareholders to CEO Fernando Aguirre calling for him to take decisive measures to respond to ongoing concerns about payments Chiquita made to terrorists in Columbia. The activists demanded Chiquita apologize for the payments, create a multi-million dollar fund for victims of terrorism in Columbia and immediately fire all employees involved in the illegal payments. Witness for Peace, a group that monitors human rights in Columbia, estimates at least 14,000 civilians were killed by Columbia guerillas and paramilitaries while Chiquita made payments to the groups. "For 15 years, Chiquita paid millions in protection money to the two most brutal armed groups in the hemisphere," said Ken. "Company executives knew that growing bananas in a war zone was dangerous. Rather than pulling out and risking their profits, they paid vicious killers to protect the business, despite the knowledge that the armed groups they were bankrolling were murdering thousands of innocent civilians." In 2007, Chiquita struck a deal with the Justice Deparment over illegal payments to brutal Columbia paramilitary groups and was forced to pay a $25 million fine. That’s not enough, claimed the event organizers. "Chiquita knew they were paying brutal killers, terrorist groups," said Ken. "Even after their lawyers and the Justice Department told them to stop, they continued payments to ensure continued profits." 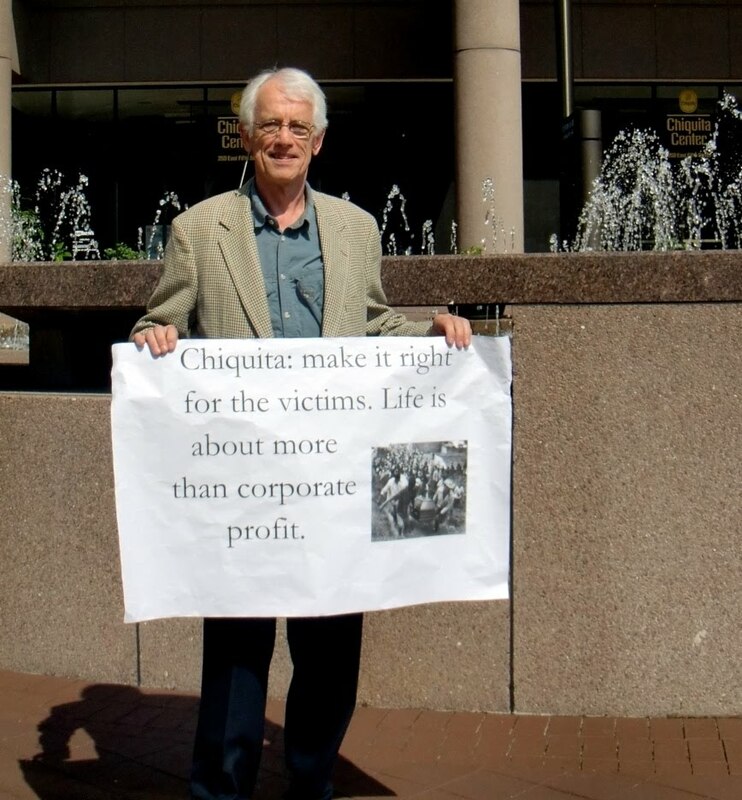 The activists demanded Chiquita create a fund for victims of Columbia’s war. The fund, they claim, should be equal in size to the profits the company made off of its Columbian operations from 1989 to 2004, the years during which the company has admitted making illegal payments. The group of activists and Chiquita shareholders also demanded all company officials involved in the illegal payments be immediately fired. "They people knowingly provided material support to terrorists and they knew innocent civilians would be killed as a result," said Ken. "They should be in jail, but at the very least they should lose their jobs. What kind of message is Chiquita sending by keeping these individuals on the payroll?" "Just last Friday Kilkenny made history when the Church of Ireland installed the first ever female Dean of Ossory at St Canice’s Cathedral. The Very Rev Katharine Poulton now holds the prestigious position and resides here in Kilkenny at the deanery. It was a big day for the COI community and the ceremony was fittingly prestigious." "I think we will be waiting some time however, before women get these kind of opportunities in the Catholic church. This is a terrible shame, as our country is currently a predominately Roman Catholic country and at the rate that we are losing our priests and the lack of new potential priests entering the seminary, we are soon going to be priest-less if we let the situation continue." "So what is the answer? Are women priests the way forward in the Catholic church? Is the idea so way out there? Unfortunately our Pope seems to think so. However, maybe it is time for the Catholic authoritarians to move with the times - most of our modern day priests have, so why shouldn’t those in charge... "
"Sister Margaret was a senior administrator of St. Joseph’s Hospital in Phoenix. A 27-year-old mother of four arrived late last year, in her third month of pregnancy. According to local news reports and accounts from the hospital and some of its staff members, the mother suffered from a serious complication called pulmonary hypertension. That created a high probability that the strain of continuing pregnancy would kill her..."
..."Sister Margaret was a member of that committee. She declined to discuss the episode with me, but the bishop of Phoenix, Thomas Olmsted, ruled that Sister Margaret was “automatically excommunicated” because she assented to an abortion.."
“The mother’s life cannot be preferred over the child’s,” the bishop’s communication office elaborated in a statement." "Let us just note that the Roman Catholic hierarchy suspended priests who abused children and in some cases defrocked them but did not normally excommunicate them, so they remained able to take the sacrament..."
...I heard about Sister Margaret from an acquaintance who is a doctor at the hospital. After what happened to Sister Margaret, he doesn’t dare be named, but he sent an e-mail to his friends lamenting the excommunication of “a saintly nun”.. "...When a hierarchy of mostly aging men pounce on and excommunicate a revered nun who was merely trying to save a mother’s life, the church seems to me almost as out of touch as it was in the cruel and debauched days of the Borgias in the Renaissance." "... Recent church history has seen an increasing emphasis on the absolute prohibition of abortion. In 1886 Leo XIII explicitly prohibited it, even where the life of the woman concerned is threatened, and in 1930 Pius XI stated that "however much we may pity the mother whose health and even life is gravely imperilled in the performance of the duty allotted to her by nature, nevertheless what could ever be a sufficient reason for excusing in any way the direct murder of the innocent?..." "... Sister Margaret believed she was acting in accordance with Article 47 of the healthcare guidelines issued by the US Conference of Catholic Bishops. This permits treatment which will result in abortion if it saves the mother's life. .."
"...Sister Margaret's case, and others like it, reveal that the Catholic Church's position on abortion is one of intractable impracticality, by which a hierarchy of male clerics bury their heads in the sand about the obvious moral problem of privileging an insentient foetus, incapable of sustaining life on its own, over the life of an adult woman with a social existence. While the discussion this week has been in the familiar terms of the right to self-determination versus the moral repugnance of "social abortion", it should be remembered that this strain of thought, one that is directly promoted by Rome and that has many devoted proponents all over the world, means that it is not only a woman's right to choose that is being threatened, but a woman's right to live..."
How can the Roman Catholic Church hierarchy claim to be pro-life when they are willing to sacrifice a mother's life in a situation where she faces death if an abortion is not performed? A mother has a right to live! "...Nuns have learned the hard way that they cannot even make decisions about their own properties since many of those are technically under institutional Church control. For example, one sister was placed under interdict for supporting the ordination of women. Another was forbidden to teach in a diocese because she, too, favored women priests. Still, they have no clerical rank and are just as lay as the rest of us..."
It appears that women priests are the big threat to the Vatican! People who supports us, including the nuns, are fired, or excommunicated and/or investigated like the women religious in the U.S. I believe the reason for such a strong reaction is fear, maybe even panic, at this stage, that our RCWP model of a more open, democratic, participatory approach of a renewed priestly ministry in inclusive communities will gain wide-spread support among Catholics. Roman Catholic Womenpriests are on the margins serving the alienated Catholics who have given up on the church as well as the progressive Catholics who long for justice and equality now. Catholics who come to our ordinations or to our worshipping communities often are filled with joy and feel that their dream of an inclusive priesthood is now a reality. They risk excommunication to attend and are overjoyed that they did. "I've waited for you all my life" is a comment we hear often from Catholics who attend our liturgies for the first time. 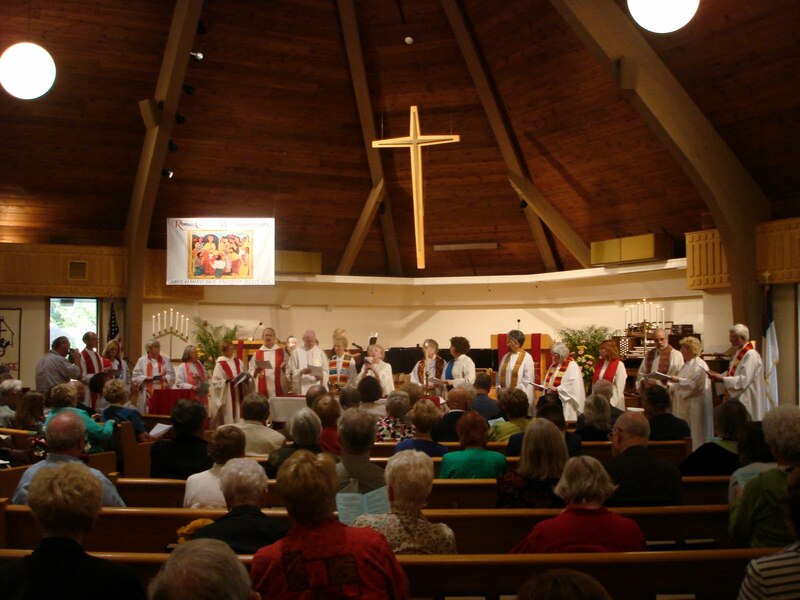 A woman in Florida called a Catholic parish to find our where the woman priest was . 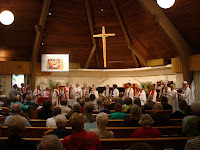 The snowbirds in my community in Florida seek to worship with a womanpriest when the go up north. We are like a mustard seed. God will provide the growth. Sisters, we are ordaining women religious. It is my hope that women's religious orders will support sisters called to a renewed priestly ministry in a community of equals. "...Bishop Thomas Olmsted excommunicated Sister Margaret McBride, an administrator at St. Joseph’s Hospital in Phoenix, after her action in agreeing that the life of an 11-week-old fetus be terminated to save the life of the mother..."
By this decision Bishop Olmsted devalues the lives of mothers, and raises real questions about the safety of women in Catholic hospitals. This is yet another reason the Catholic Church desperately needs Roman Catholic Womenpriests and bishops! As a woman religious, I admire Sister Margaret McBride for her courageous ethical decision. Once again, it appears that the nuns are leading the way. ..."What has emerged, without intention and seemingly by the default of a paralyzed episcopacy, is a parallel leadership structure within the church. These prayerful women have pondered their souls and their congregation’s constitutions and, empowered by each other, are reaching farther than they ever might have imagined..."
"The reality of their standing within the church was dramatized at the global women religious meeting this month. While, canonically, leaders of all 800 women religious congregations represented in Rome report to Slovenian Cardinal Franc Rodé, prefect of the Congregation for Institutes of Consecrated Life and Societies of Apostolic Life, the prelate sent word he was “unable” to attend the once-in-three-years gathering, taking place some three miles from his office. On the women’s schedule for the last day, a program planned for years, was an audience with Pope Benedict XVI. However, he canceled, having decided to visit Portugal, which included a well-publicized visit to the shrine of Our Lady of Fatima." ..."To pay attention to the ministries of our church’s women religious is to hear an increasingly clear articulation of what it means to be a Christian in the 21st century. These women are claiming their experiences as sacred callings, and in so doing, are encouraging the rest of us to live out our Christian vocations, whatever hardships these might involve." within us and among us as we work for justice, equality, compassion and peace. Come, Holy Spirit, come, embrace us in the Heart of Love that we might embody the Wisdom of Christ-Sophia in all our relationships. where we discover Your divine footprints everywhere. Come, Holy Spirit, come, speak to our hearts on this Pentecost day. Heal us. Energize us. Fill us with your gifts so that we may serve others generously and lovingly. May we, the Body of Christ, live vibrantly as Christ-Presence in our church and world. Amen. "Ultimately, it was a matter of listening to her conscience. Mary Styne knew that many people would not understand. Styne also believed that she was called to become a Roman Catholic priest. 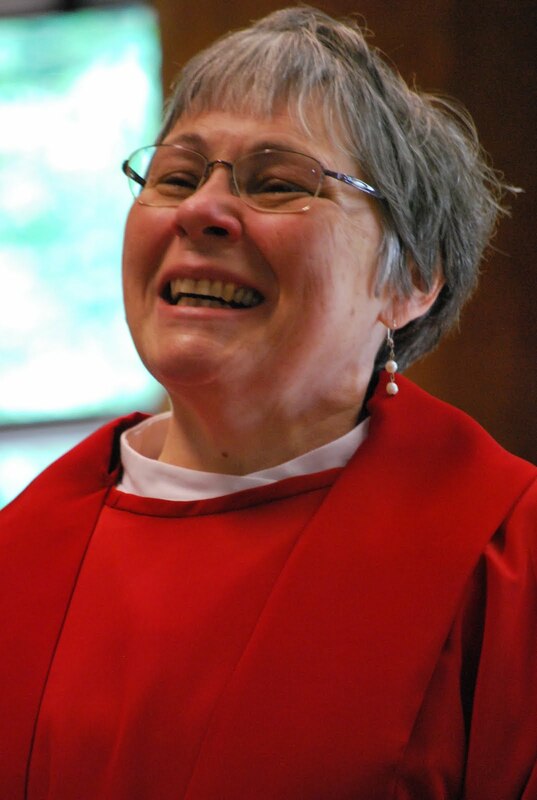 Last year, she was ordained as part of the Roman Catholic Womanpriests movement..."